Manchester United’s interest in Cesc Fabregas has forced Chelsea into early talks with midfielder over a contract extension, according to reports from the Metro. Manchester United dealt Chelsea with a huge blow over the summer after making a swoop for key midfielder Nemanja Matic and it has been clear to see that the Serbian international’s presence has significantly strengthened the Red Devils while at the same time weakening the Blues. In another move of a similar nature, Manchester United are reportedly plotting a swoop for Cesc Fabregas from Chelsea once again and it is believed that the Red Devils are hopeful of taking advantage of the midfielder’s contract situation at Stamford Bridge as it expires in 18 months. 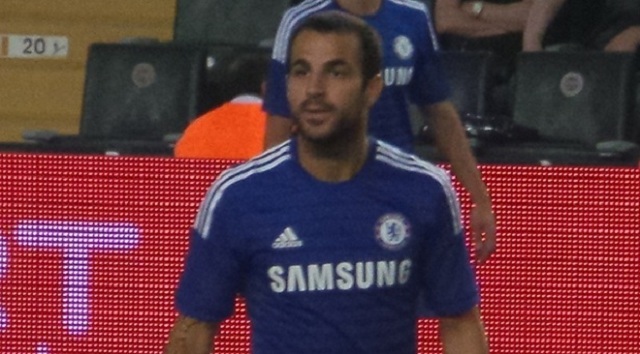 Now according to reports from the Metro, Chelsea have been alerted regarding United’s interest in acquiring the services of Fabregas and the defending Premier League champions are now scampering to tie the Spanish international down to a fresh new contract. Fabregas enjoyed a strong relationship with United manager Jose Mourinho from their time together at Chelsea and it will be interesting to see if the Portuguese manager will be able to lure another Blues star to Old Trafford next summer.